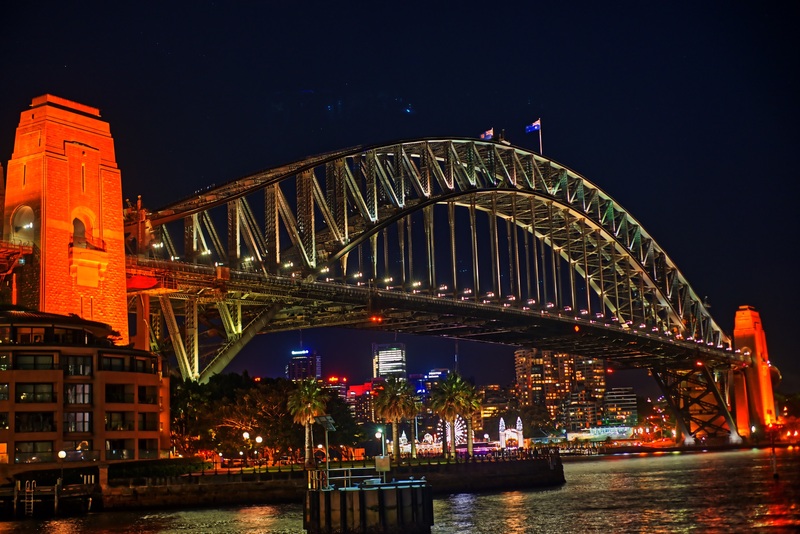 On March 19, 1932, the Sydney Harbour Bridge in Sydney, New South Wales, Australia, opened. 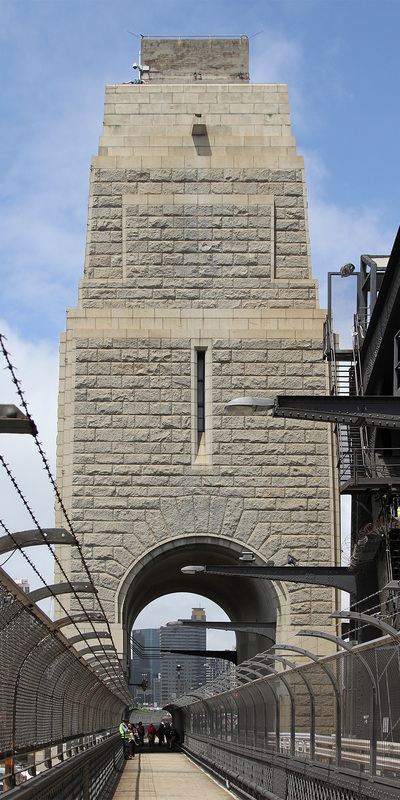 This is a heritage-listed steel through arch bridge across Sydney Harbour that carries rail, vehicular, bicycle, and pedestrian traffic between the Sydney central business district (CBD) and the North Shore. The dramatic view of the bridge, the harbor, and the nearby Sydney Opera House is an iconic image of Sydney, and Australia itself. The bridge is nicknamed “The Coathanger” because of its arch-based design. Under the direction of Dr John Bradfield of the NSW Department of Public Works, the bridge was designed and built by British firm Dorman Long and Co Ltd. of Middlesbrough. 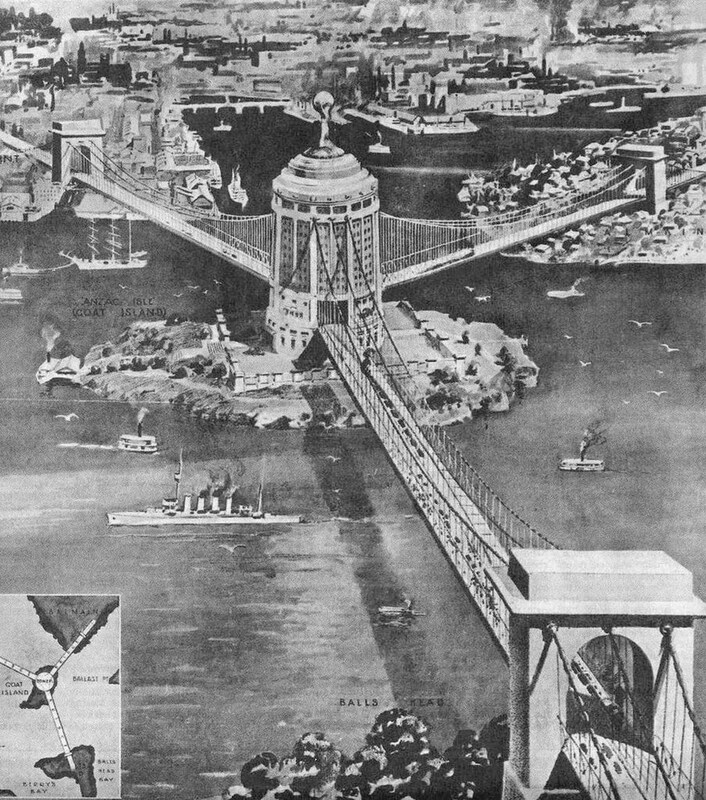 The bridge’s design was influenced by the Hell Gate Bridge in New York City. It is the sixth longest spanning-arch bridge in the world and the tallest steel arch bridge, measuring 440 feet (134 m) from top to water level. It was also the world’s widest long-span bridge, at 160 feet (48.8 m) wide, until construction of the new Port Mann Bridge in Vancouver was completed in 2012. The Sydney Harbour Bridge was added to the Australian National Heritage List on March 19, 2007, and to the New South Wales State Heritage Register on June 25, 1999. Sydney Harbour from the air, showing the Opera House, the CBD, Circular Quay, the Bridge, the Parramatta River, North Sydney and Kirribilli in the foreground. 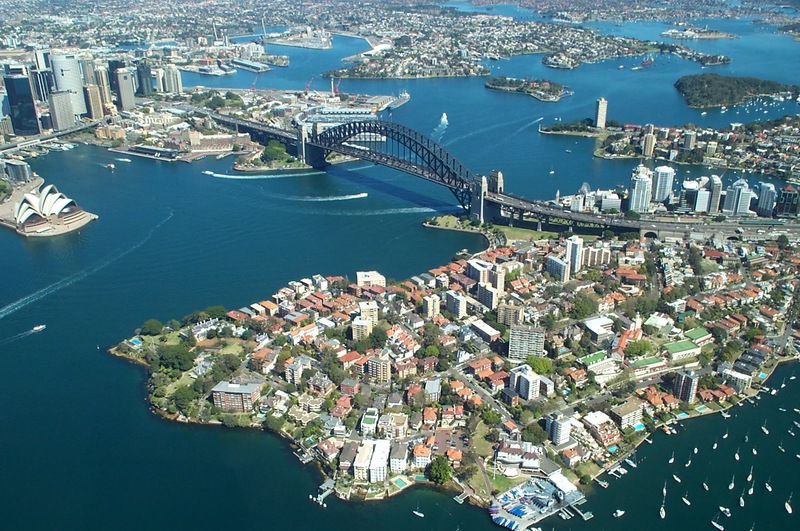 The southern end of the bridge is located at Dawes Point in The Rocks area, and the northern end at Milsons Point in the lower North Shore area. There are six original lanes of road traffic through the main roadway, plus an additional two lanes of road traffic on its eastern side, using lanes that were formerly tram tracks. Adjacent to the road traffic, a path for pedestrian use runs along the eastern side of the bridge, whilst a dedicated path for bicycle use only runs along the western side; between the main roadway and the western bicycle path are two lanes used for railway tracks, servicing the T1 North Shore Line for Sydney Trains. The main roadway across the bridge is known as the Bradfield Highway and is about 1.5 miles (2.4 km) long, making it one of the shortest highways in Australia. The arch is composed of two 28-panel arch trusses; their heights vary from 59 feet (18 m) at the center of the arch to 187 feet (57 m) at the ends next to the pylons. The arch has a span of 1.654 feet (504 m) and its summit is 550 feet (134 m) above mean sea level; expansion of the steel structure on hot days can increase the height of the arch by 7.1 inches (18 cm). The total weight of the steelwork of the bridge, including the arch and approach spans, is 52,800 tonnes (52,000 long tons; 58,200 short tons), with the arch itself weighing 39,000 tonnes (38,000 long tons; 43,000 short tons). About 79% of the steel was imported from England, with the rest being sourced from Newcastle. On site, the contractors (Dorman Long and Co.) set up two workshops at Milsons Point, at the site of the present day Luna Park, and fabricated the steel into the girders and other required parts. Sydney Harbour Bridge as viewed from Kirribilli on the North Shore, with the Sydney Opera House on the left. Photo taken by David Liff on June 15, 2005. Used under the Creative Commons Attribution-Share Alike 3.0 Unported license. The bridge is held together by six million Australian-made hand-driven rivets supplied by the McPherson company of Melbourne, the last being driven through the deck on January 21, 1932. The rivets were heated red-hot and inserted into the plates; the headless end was immediately rounded over with a large pneumatic rivet gun. The largest of the rivets used weighed 8 pounds (3.5 kg) and was 15.6 inches (39.5 cm) long. The practice of riveting large steel structures, rather than welding, was, at the time, a proven and understood construction technique, whilst structural welding had not at that stage been adequately developed for use on the bridge. At each end of the arch stands a pair of 292-feet (89 m) high concrete pylons, faced with granite. The pylons were designed by the Scottish architect Thomas S. Tait, a partner in the architectural firm John Burnet & Partners. Some 250 Australian, Scottish, and Italian stonemasons and their families relocated to a temporary settlement at Moruya, NSW, 186 miles (300 km) south of Sydney, where they quarried around 635,664 cubic feet (18,000 m³) of granite for the bridge pylons. The stonemasons cut, dressed, and numbered the blocks, which were then transported to Sydney on three ships built specifically for this purpose. The Moruya quarry was managed by John Gilmore, a Scottish stonemason who emigrated with his young family to Australia in 1924, at the request of the project managers. The concrete used was also Australian-made and supplied from Railton, Tasmania and Kandos, New South Wales. Abutments at the base of the pylons are essential to support the loads from the arch and hold its span firmly in place, but the pylons themselves have no structural purpose. They were included to provide a frame for the arch panels and to give better visual balance to the bridge. The pylons were not part of the original design, and were only added to allay public concern about the structural integrity of the bridge. The south-eastern pylon of the Sydney Harbour Bridge from the pedestrian walkway. This pylon contains the tourist lookout and exhibits (a tourist can be seen at the lookout at the top of the pylon). The pylons were made from 18,000 m3 of granite quarried at Moruya, NSW, 300 km south of Sydney, and transported to Sydney on three custom built ships. Sydney, New South Wales, Australia. Photo taken by John O’Neil’ on December 2, 2010. Used under the terms of the GNU Free Documentation License, Version 1.2 only. Although originally added to the bridge solely for their aesthetic value, all four pylons have now been put to use. The south-eastern pylon contains a museum and tourist center, with a 360° lookout at the top providing views across the harbor and city. The south-western pylon is used by the New South Wales Roads and Traffic Authority (RTA) to support its CCTV cameras overlooking the bridge and the roads around that area. The two pylons on the north shore include venting chimneys for fumes from the Sydney Harbour Tunnel, with the base of the southern pylon containing the RMS maintenance shed for the bridge, and the base of the northern pylon containing the traffic management shed for tow trucks and safety vehicles used on the bridge. In 1942, the pylons were modified to include parapets and anti-aircraft guns designed to assist in both Australia’s defense and general war effort. The top level of stonework was never removed. There had been plans to build a bridge as early as 1815, when convict and noted architect Francis Greenway reputedly proposed to Governor Lachlan Macquarie that a bridge be built from the northern to the southern shore of the harbor. In 1825, Greenway wrote a letter to The Australian newspaper stating that such a bridge would “give an idea of strength and magnificence that would reflect credit and glory on the colony and the Mother Country”. Nothing came of Greenway’s suggestions, but the idea remained alive, and many further suggestions were made during the nineteenth century. In 1840, naval architect Robert Brindley proposed that a floating bridge be built. Engineer Peter Henderson produced one of the earliest known drawings of a bridge across the harbour around 1857. A suggestion for a truss bridge was made in 1879, and in 1880 a high-level bridge estimated at $850,000 was proposed. In 1900, the Lyne government committed to building a new Central railway station and organized a worldwide competition for the design and construction of a harbor bridge. Local engineer Norman Selfe submitted a design for a suspension bridge and won the second prize of £500. In 1902, when the outcome of the first competition became mired in controversy, Selfe won a second competition outright, with a design for a steel cantilever bridge. The selection board were unanimous, commenting that, “The structural lines are correct and in true proportion, and… the outline is graceful”. However due to an economic downturn and a change of government at the 1904 NSW State election construction never began. Three-span bridge linking Millers Point with Balls Head and Balmain, proposed by Ernest Stowe on September 26, 1922. A unique three-span bridge was proposed in 1922 by Ernest Stowe with connections at Balls Head, Millers Point, and Balmain with a memorial tower and hub on Goat Island. In 1914, John Bradfield was appointed “Chief Engineer of Sydney Harbour Bridge and Metropolitan Railway Construction”, and his work on the project over many years earned him the legacy as the “father” of the bridge. Bradfield’s preference at the time was for a cantilever bridge without piers, and in 1916 the NSW Legislative Assembly passed a bill for such a construction, however it did not proceed as the Legislative Council rejected the legislation on the basis that the money would be better spent on the war effort. Following World War I, plans to build the bridge again built momentum. Bradfield persevered with the project, fleshing out the details of the specifications and financing for his cantilever bridge proposal, and in 1921 he traveled overseas to investigate tenders. On return from his travels Bradfield decided that an arch design would also be suitable and he and officers of the NSW Department of Public Works prepared a general design for a single-arch bridge based upon New York City’s Hell Gate Bridge. In 1922, the government passed the Sydney Harbour Bridge Act No. 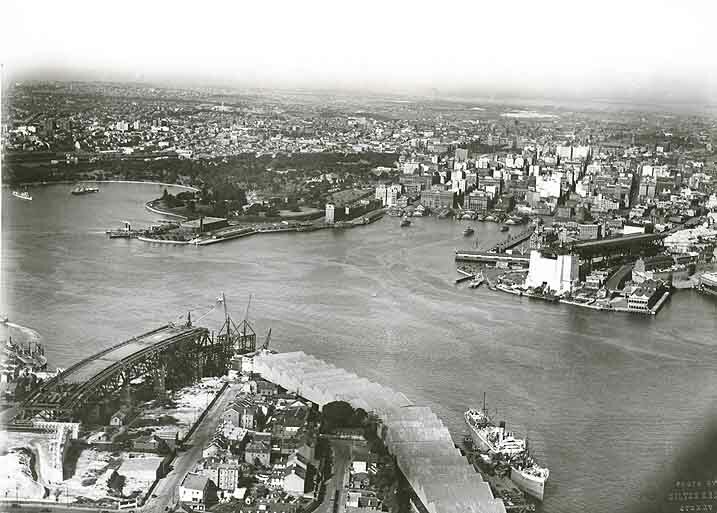 28, specifying the construction of a high-level cantilever or arch bridge across the harbor between Dawes Point and Milsons Point, along with construction of necessary approaches and electric railway lines, and worldwide tenders were invited for the project. As a result of the tendering process, the government received twenty proposals from six companies; on March 24, 1924, the contract was awarded to British firm Dorman Long and Co Ltd, of Middlesbrough well known as the contractors who built the similar Tyne Bridge of Newcastle Upon Tyne, for an arch bridge at a quoted price of AU£4,217,721 11s 10d. The arch design was cheaper than alternative cantilever and suspension bridge proposals, and also provided greater rigidity making it better suited for the heavy loads expected. Bradfield and his staff were ultimately to oversee the entire bridge design and building process, while Dorman Long and Co’s Consulting Engineer, Sir Ralph Freeman of Sir Douglas Fox and Partners, and his associate Mr. G.C. Imbault, carried out the detailed design and erection process of the bridge. Architects for the contractors were from the British firm John Burnet & Partners of Glasgow, Scotland. Sydney Harbour Bridge. approaches as scene from the air during construction.. The building of the bridge coincided with the construction of a system of underground railways in Sydney’s CBD, known today as the City Circle, and the bridge was designed with this in mind. The bridge was designed to carry six lanes of road traffic, flanked on each side by two railway tracks and a footpath. Both sets of rail tracks were linked into the underground Wynyard railway station on the south (city) side of the bridge by symmetrical ramps and tunnels. The eastern-side railway tracks were intended for use by a planned rail link to the Northern Beaches; in the interim they were used to carry trams from the North Shore into a terminal within Wynyard station, and when tram services were discontinued in 1958, they were converted into extra traffic lanes. The Bradfield Highway, which is the main roadway section of the bridge and its approaches, is named in honor of Bradfield’s contribution to the bridge. The building of the bridge was under the management of Bradfield. Three other people heavily involved in the bridge’s design and construction were Lawrence Ennis, Edward Judge, and Sir Ralph Freeman. Ennis was the engineer-in-charge at Dorman Long and Co and the main on-site supervisor (Bradfield visited occasionally throughout the project and, in particular, at many key stages of the project, to inspect progress and make managerial decisions), Judge was chief technical engineer of Dorman Long, and Freeman was hired by the company to design the accepted model in further detail. Later a bitter disagreement broke out between Bradfield and Freeman as to who actually designed the bridge. The official ceremony to mark the “turning of the first sod” occurred on July 28, 1923, on the spot at Milsons Point on the north shore where two workshops to assist in building the bridge were to be constructed. An estimated 469 buildings on the north shore, both private homes and commercial operations, were demolished to allow construction to proceed, with little or no compensation being paid. Work on the bridge itself commenced with the construction of approaches and approach spans, and by September 1926 concrete piers to support the approach spans were in place on each side of the harbor. As construction of the approaches took place, work was also started on preparing the foundations required to support the enormous weight of the arch and loadings. Concrete and granite faced abutment towers were constructed, with the angled foundations built into their sides. Once work had progressed sufficiently on the support structures, a giant “creeper crane” was erected on each side of the harbor. These cranes were fitted with a cradle, and then used to hoist men and materials into position to allow for erection of the steelwork. To stabilize works while building the arches, tunnels were excavated on each shore with steel cables passed through them and then fixed to the upper sections of each half-arch to stop them collapsing as they extended outwards. Arch construction itself began on October 26, 1928. The southern end of the bridge was worked on ahead of the northern end, to detect any errors and to help with alignment. The cranes would “creep” along the arches as they were constructed, eventually meeting up in the middle. In less than two years, on Tuesday, August 19, 1930, the two halves of the arch touched for the first time. Workers riveted both top and bottom sections of the arch together, and the arch became self-supporting, allowing the support cables to be removed. 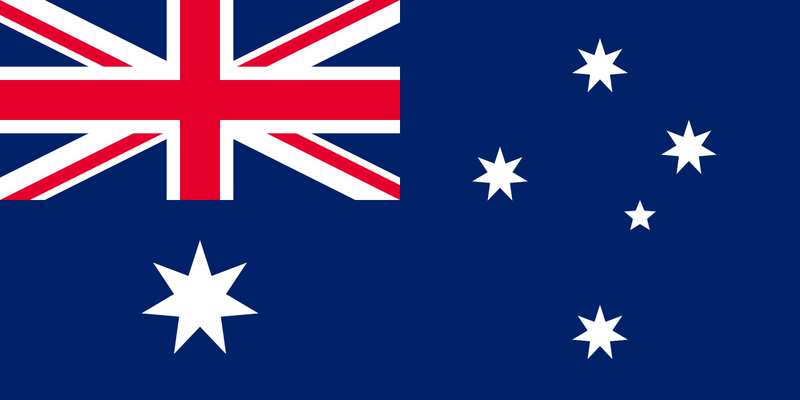 On August 20, the joining of the arches was celebrated by flying the flags of Australia and the United Kingdom from the jibs of the creeper cranes. 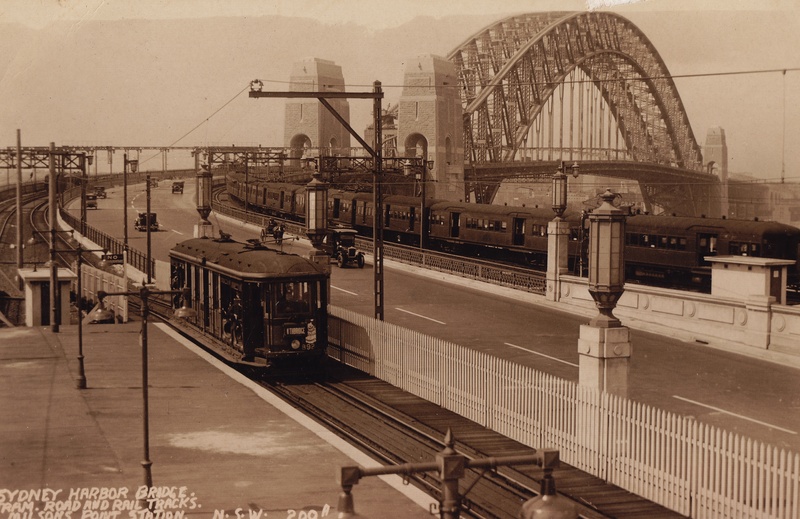 Sydney Harbour Bridge, tram, road and rail tracks and Milsons Point Station, 1935. Once the arch was completed, the creeper cranes were then worked back down the arches, allowing the roadway and other parts of the bridge to be constructed from the centre out. The vertical hangers were attached to the arch, and these were then joined with horizontal crossbeams. The deck for the roadway and railway were built on top of the crossbeams, with the deck itself being completed by June 1931, and the creeper cranes were dismantled. Rails for trains and trams were laid, and road was surfaced using concrete topped with asphalt. Power and telephone lines, and water, gas, and drainage pipes were also all added to the bridge in 1931. The pylons were built atop the abutment towers, with construction advancing rapidly from July 1931. Carpenters built wooden scaffolding, with concreters and masons then setting the masonry and pouring the concrete behind it. Gangers built the steelwork in the towers, while day labourers manually cleaned the granite with wire brushes. The last stone of the north-west pylon was set in place on January 15, 1932, and the timber towers used to support the cranes were removed. On January 19, the first test train, a steam locomotive, safely crossed the bridge. Load testing of the bridge took place in February 1932, with the four rail tracks being loaded with as many as 96 steam locomotives positioned end-to-end. The bridge underwent testing for three weeks, after which it was declared safe and ready to be opened. The construction worksheds were demolished after the bridge was completed, and the land that they were on is now occupied by Luna Park. The standards of industrial safety during construction were poor by today’s standards. Sixteen workers died during construction, but surprisingly only two from falling off the bridge. Several more were injured from unsafe working practices undertaken whilst heating and inserting its rivets, and the deafness experienced by many of the workers in later years was blamed on the project. Henri Mallard between 1930 and 1932 produced hundreds of stills and film footage which reveal at close quarters the bravery of the workers in tough Depression-era conditions. The total financial cost of the bridge was AU £6.25 million, which was not paid off in full until 1988. 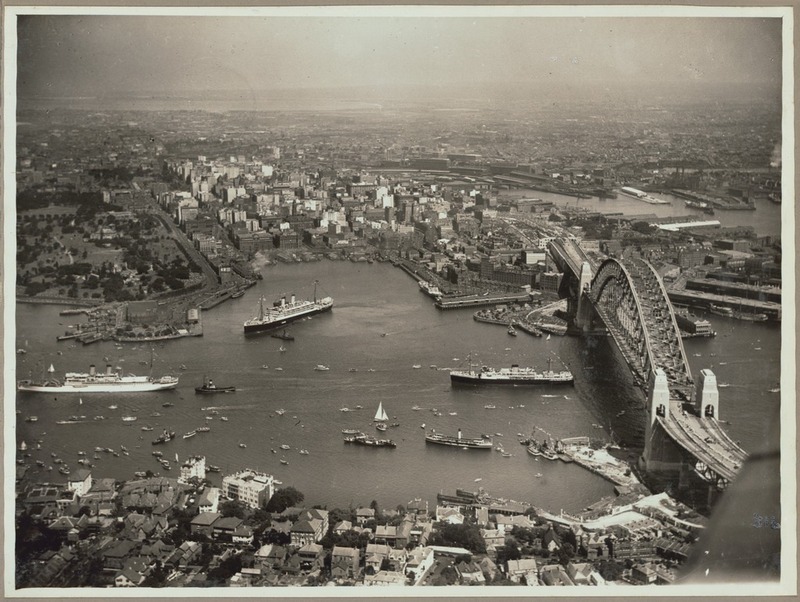 Aerial view of Sydney and Circular Quay on the day of the official opening of the Sydney Harbour Bridge, March 19, 1932. The bridge was formally opened on Saturday, March 19, 1932. Among those who attended and gave speeches were the Governor of New South Wales, Sir Philip Game, and the Minister for Public Works, Lawrence Ennis. The Premier of New South Wales, Jack Lang, was to open the bridge by cutting a ribbon at its southern end. However, just as Lang was about to cut the ribbon, a man in military uniform rode up on a horse, slashing the ribbon with his sword and opening the Sydney Harbour Bridge in the name of the people of New South Wales before the official ceremony began. He was promptly arrested. The ribbon was hurriedly retied and Lang performed the official opening ceremony and Game thereafter inaugurated the name of the bridge as ‘Sydney Harbour Bridge’ and the associated roadway as the ‘Bradfield Highway’. After they did so, there was a 21-gun salute and an RAAF flypast. The intruder was identified as Francis de Groot. He was convicted of offensive behavior and fined £5 after a psychiatric test proved he was sane, but this verdict was reversed on appeal. De Groot then successfully sued the Commissioner of Police for wrongful arrest, and was awarded an undisclosed out of court settlement. De Groot was a member of a right-wing paramilitary group called the New Guard, opposed to Lang’s leftist policies and resentful of the fact that a member of the Royal Family had not been asked to open the bridge. De Groot was not a member of the regular army but his uniform allowed him to blend in with the real cavalry. This incident was one of several involving Lang and the New Guard during that year. A similar ribbon-cutting ceremony on the bridge’s northern side by North Sydney’s mayor, Alderman Primrose, was carried out without incident. It was later discovered that Primrose was also a New Guard member but his role in and knowledge of the de Groot incident, if any, are unclear. The pair of golden scissors used in the ribbon cutting ceremonies on both sides of the bridge was also used to cut the ribbon at the dedication of the Bayonne Bridge, which had opened between Bayonne, New Jersey, and New York City the year before. Despite the bridge opening in the midst of the Great Depression, opening celebrations were organized by the Citizens of Sydney Organising Committee, an influential body of prominent men and politicians that formed in 1931 under the chairmanship of the Lord Mayor to oversee the festivities. The celebrations included an array of decorated floats, a procession of passenger ships sailing below the bridge, and a Venetian Carnival. A message from a primary school in Tottenham, 320 miles (515 km) away in rural New South Wales, arrived at the bridge on the day and was presented at the opening ceremony. It had been carried all the way from Tottenham to the bridge by relays of school children, with the final relay being run by two children from the nearby Fort Street Boys’ and Girls’ schools. After the official ceremonies, the public was allowed to walk across the bridge on the deck, something that would not be repeated until the 50th anniversary celebrations. Estimates suggest that between 300,000 and one million people took part in the opening festivities, a phenomenal number given that the entire population of Sydney at the time was estimated to be 1,256,000. 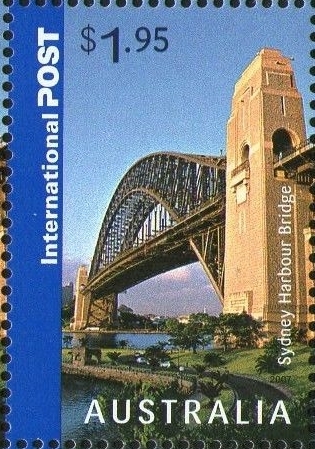 Cover bearing Australia Scott #131, posted at the Sydney Harbour Bridge just over one week after the dedication ceremonies. [NIMC 2019] Image sourced from active eBay auction. There had also been numerous preparatory arrangements. On March 14, 1932, three postage stamps were issued to commemorate the imminent opening of the bridge (Scott #130-132). Several songs were composed for the occasion. The bridge itself was regarded as a triumph over Depression times, earning the nickname “the Iron Lung”, as it kept many Depression-era workers employed. Even during its construction, the bridge was such a prominent feature of Sydney that it would attract tourist interest. One of the ongoing tourist attractions of the bridge has been the south-east pylon, which is accessed via the pedestrian walkway across the bridge, and then a climb to the top of the pylon of about 200 steps. Not long after the bridge’s opening, commencing in 1934, Archer Whitford first converted this pylon into a tourist destination. He installed a number of attractions, including a café, a camera obscura, an Aboriginal museum, a “Mother’s Nook” where visitors could write letters, and a “pashometer”. The main attraction was the viewing platform, where “charming attendants” assisted visitors to use the telescopes available, and a copper cladding (still present) over the granite guard rails identified the suburbs and landmarks of Sydney at the time. A close view of Sydney Harbour Bridge at night. Photo taken by Chen Hualin on February 15, 2019. Used under the Creative Commons Attribution-Share Alike 4.0 International license. The outbreak of World War II in 1939 saw tourist activities on the bridge cease, as the military took over the four pylons and modified them to include parapets and anti-aircraft guns. In 1948, Yvonne Rentoul opened the “All Australian Exhibition” in the south-east pylon. This contained dioramas, and displays about Australian perspectives on subjects such as farming, sport, transport, mining, and the armed forces. An orientation table was installed at the viewing platform, along with a wall guide and binoculars. The owner kept several white cats in a rooftop cattery, which also served as an attraction, and there was a souvenir shop and postal outlet. Rentoul’s lease expired in 1971, and the pylon and its lookout remained closed to the public for over a decade. The pylon was reopened in 1982, with a new exhibition celebrating the bridge’s 50th anniversary. In 1987 a “Bicentennial Exhibition” was opened to mark the 200th anniversary of European settlement in Australia in 1988. The pylon was closed from April to November 2000 for the Roads & Traffic Authority and BridgeClimb to create a new exhibition called “Proud Arch”. The exhibition focused on Bradfield, and included a glass direction finder on the observation level, and various important heritage items. The pylon again closed for four weeks in 2003 for the installation of an exhibit called “Dangerous Works”, highlighting the dangerous conditions experienced by the original construction workers on the bridge, and two stained glass feature windows in memory of the workers. In 1950s and 1960s, there were occasional newspaper reports of climbers who had made illegal arch traversals of the bridge, invariably by night. In 1973, Philippe Petit walked across a wire between the two pylons at the southern end of the Sydney Harbour Bridge. Since 1998, BridgeClimb has made it possible for tourists to legally climb the southern half of the bridge. Tours run throughout the day, from dawn to night, and are only cancelled for electrical storms or high wind. 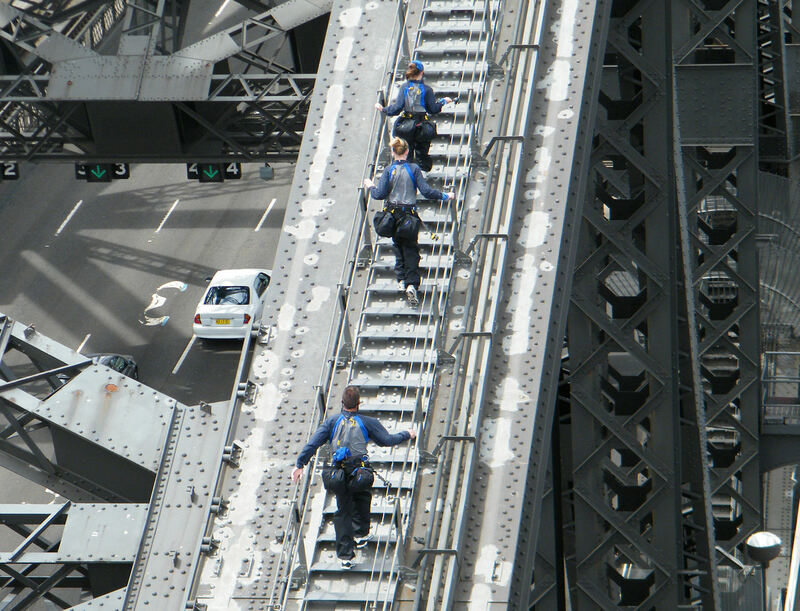 Participants on the BridgeClimb on the Sydney Harbour Bridge, as seen from the Pylon Lookout. Photographed by user Coolcaesar on November 29, 2009. Used under the Creative Commons Attribution-Share Alike 3.0 Unported license. Groups of climbers are provided with protective clothing appropriate to the prevailing weather conditions, and are given an orientation briefing before climbing. During the climb, attendees are secured to the bridge by a wire lifeline. Each climb begins on the eastern side of the bridge and ascends to the top. At the summit, the group crosses to the western side of the arch for the descent. Each climb takes three-and-a-half-hours, including the preparations. In December 2006, BridgeClimb launched an alternative to climbing the upper arches of the bridge. The Discovery Climb allows climbers to ascend the lower chord of the bridge and view its internal structure. From the apex of the lower chord, climbers ascend a staircase to a platform at the summit. 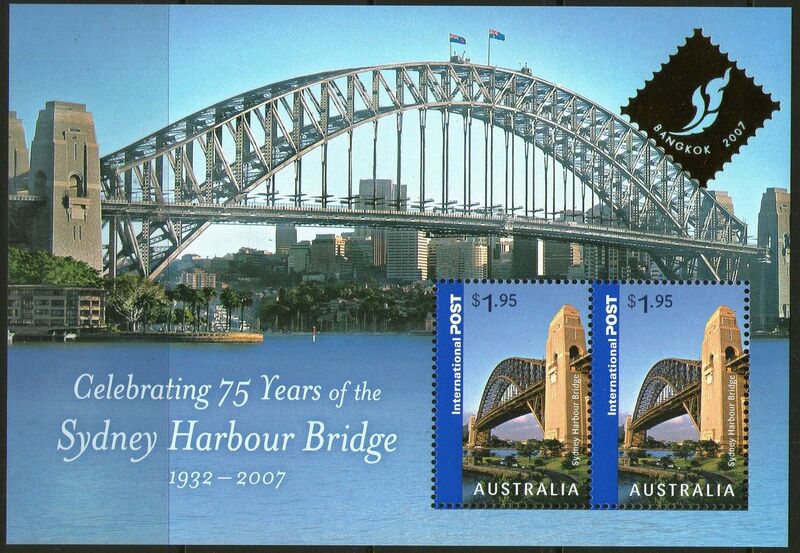 On March 19, 2007, the Sydney Harbour Bridge celebrated its 75th anniversary. The occasion was marked with a ribbon-cutting ceremony by the governor, Marie Bashir and the premier of New South Wales, Morris Iemma. The bridge was subsequently open to the public to walk southward from Milsons Point or North Sydney. Several major roads, mainly in the CBD, were closed for the day. An Aboriginal smoking ceremony was held at 19:00. Approximately 250,000 people (50,000 more than were registered) took part in the event. Bright yellow souvenir caps were distributed to walkers. A series of speakers placed at intervals along the bridge formed a sound installation. Each group of speakers broadcast sound and music from a particular era (e.g. King Edward VIII’s abdication speech; Gough Whitlam’s speech at Parliament House in 1975), the overall effect being that the soundscape would “flow” through history as walkers proceeded along the bridge. A light-show began after sunset and continued late into the night, the bridge being bathed in constantly changing, multi-coloured lighting, designed to highlight structural features of the bridge. In the evening the bright yellow caps were replaced by orange caps with a small, bright LED attached. The bridge was closed to walkers at about 20:30. 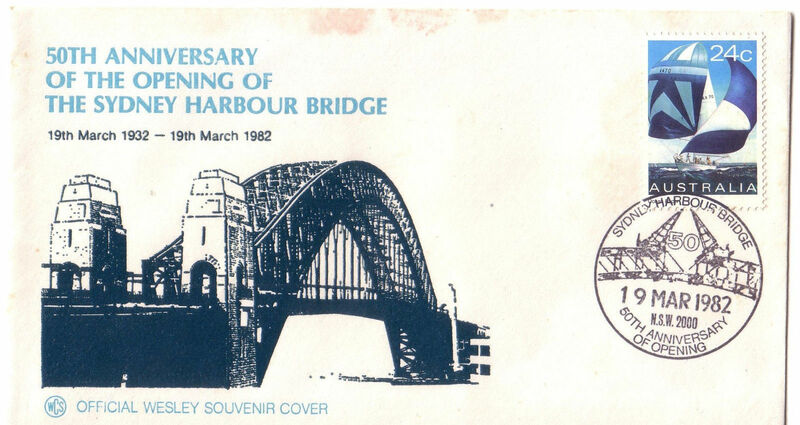 Cover marking the 50th anniversary of the opening of the Sydney Harbor Bridge in 1982. During 2007, an exhibition was shown at the Museum of Sydney, called “Bridging Sydney”. An initiative of the Historic Houses Trust, the exhibition featured dramatic photographs and paintings with rare and previously unseen alternative bridge and tunnel proposals, plans and sketches. 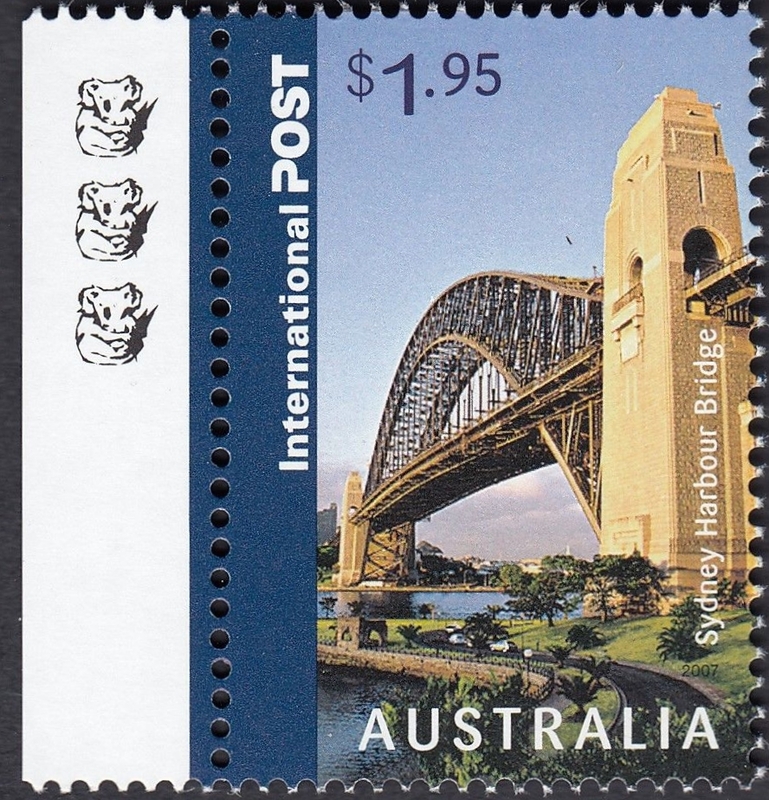 On May 8, 2007, Australia Post released stamps in several formats bearing the same design and denomination of A$ 1.95 portraying the bridge. There was a version printed by offset lithography in sheets of 20, perforated 14½ x 14 (Scott #2675); self-adhesive booklet stamps with syncopated serpentine die cut perforations of 11¼ (Scott #2677); and self-adhesive stamps in personalized sheets of 20 with serpentine die cuts measuring 11½ x 11¼ (Scott #2679). One June 15, 2007, a souvenir sheet containing two stamps of this design, one of which was perforated 14 only one the right side of the stamp (Scott #2675b). 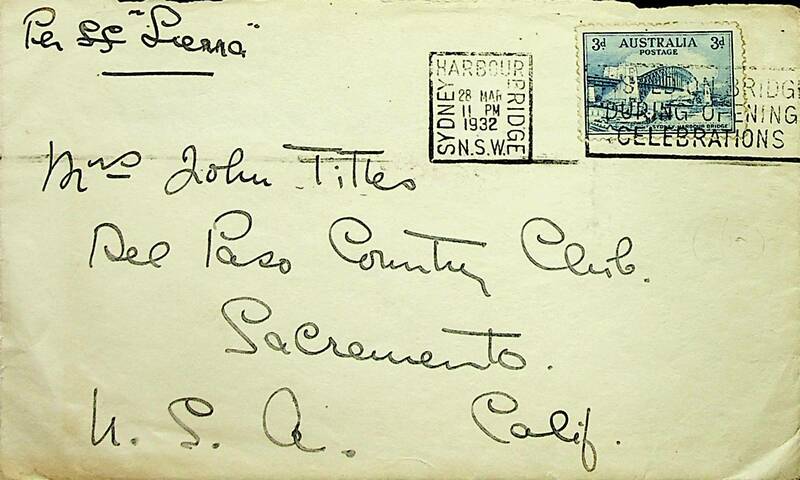 On the same date, a similar souvenir sheet was issued with both stamps perforated on all sides and also including the logo of the Sydney Philatelic Show imprinted in gold (Scott #2675c). Later in the year, souvenir sheets were issued with overprints for the Sberatel Exhibition in Prague (on #2675b and listed as #2675d) and the Bangkok 2007 Exhibition (on Scott #2675c and listed as #2675e).